This recipe is a very light and healthy recipe, perfect for after a huge Thanksgiving break! The lemon and pomegranate add a tangy flavor to the fish, while the beans add a nice smooth, almost creamy feeling. Pomegranates are in season right now so it is the perfect time to make this dish! In a large saucepan, sauté the garlic in the olive oil over medium-high heat (About 1 minutes). Lower the heat to medium, add the beans and sauté (about 2 minutes). Add the broth, parsley and pepper and cook for a couple additional minutes. Add the juice of the two lemons and the mahi mahi and cook until mahi mahi is cooked through (about 5 minutes per side). 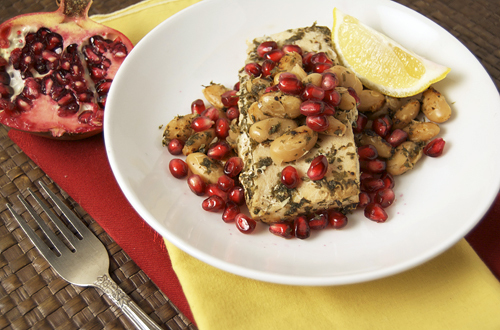 To serve, place one filet of mahi mahi, ½ cup beans and 2 tbsp pomegranate seeds on each plate. 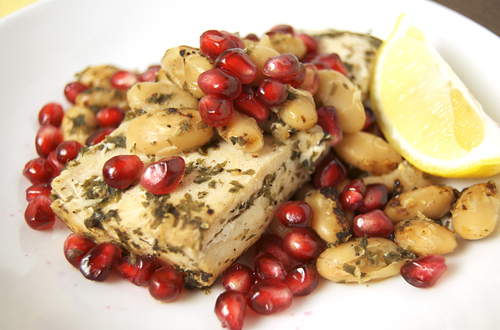 Wow – I love mahi mahi, and lemon is ideal with almost any fish, but I wouldn’t ever think of pomegranate seeds! The color is gorgeous, and I bet it’s a very holiday-appropriately flavored dish. 🙂 Wonderful idea! How festive and beautiful! Looks delicious! What a creative preparation of Mahi Mahi! I love the lemony beans on it too! Great job! This is such a beautiful way to make mahi mahi. I love pomegranates, and I bet the seeds gave it a great burst of flavor as well as a nice crunch. I’m pinning this so I can remember to try this one on fish! Great post! Whenever I need a pomegranate for a recipe, I always buy, too. One guaranteed for the recipe amount and the other for snacking while I make everything, hehe. I love them…so addictive! I bet lemon and pomegranate are a brilliant combination. This whole things sounds fantastic! That looks so delicious. The pomegranates make this special I think. I used to eat pomegranates right off the tree all the time when I lived in Texas.